Public Transportation – Toastmasters 2016 International Convention – Washington D.C.
PUBLIC TRANSPORTATION IN WASHINGTON, D.C. The Washington Metropolitan Area Transit Authority (WMATA) is the public transportation system in the District of Columbia and environs. There are two major components to WMATA: MetroRail and MetroBus. Metrorail (or, for short, Metro) stations are located throughout Washington, D.C., and in the bordering states of Maryland and Virginia. Route maps and schedules are available on Metro’s website, www.wmata.com. Visitor information is detailed on the following page: http://www.wmata.com/getting_around/visitor_info/. 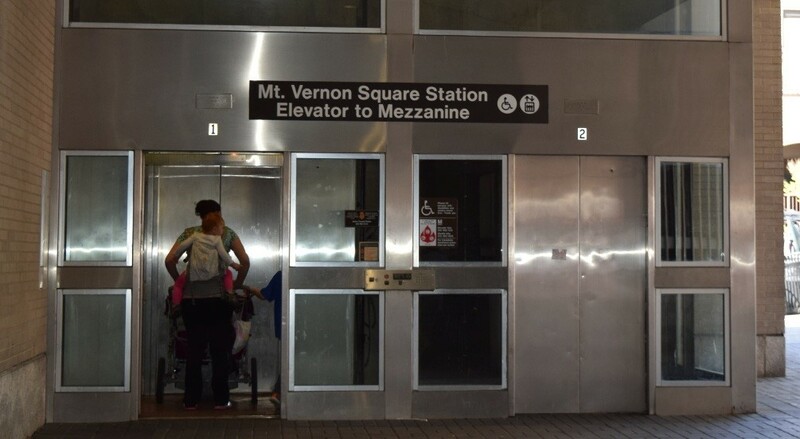 The closest Metro stations to the Marriott Marquis Hotel are the Mount Vernon Square station (on the Yellow Line and Green Line) and the Gallery Place/Chinatown station (a connecting station that serves the Red Line, Yellow Line, and Green Line). Look for the large brown columns with lettering to find the entrances to stations. Machines for purchasing or adding value to the cards are located at all entrances to Metrorail stations. $2 of the initial purchase of your SmarTrip goes toward the card itself. You can then manage your card and reload money at wmata.com to avoid lines at the fare machines. Trains go in two directions, named for the last stop on the line for that particular train. Some lines shorten their runs during rush hour in order to run more trains when the system is busiest. Check the System map to verify the direction you want to travel. 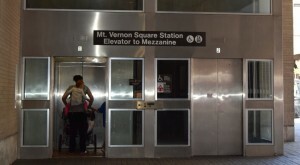 Stations are accessible by stairs, escalators, and elevators. Elevator and escalator outages are frequent, and are announced through the WMATA website and through announcements made throughout the system. Like any large transit system, delays or other problems can occur on specific bus or rail lines or at stations. For fast information, check service status at wmata.com, or for more detailed information, click through to the Alerts Web page. The Metro is generally safe; however, the District is a large, cosmopolitan city. It never hurts to be alert and aware of your personal surroundings and to be careful of personal possessions, particularly cell phones. On escalators, it’s local custom to stand to the right and walk up or down on the left — commuters will be glad you’re in the know! Also, please don’t pause at the top or bottom of the escalator — that’s dangerous! If you need to orient yourself, take a few steps away from the escalator before you pause. Be considerate of others when toting rolling luggage, especially in crowded Metro stations or train cars. The Metrorail SafeTrack track work plan is compressing maintenance upgrades in a short period of time. Check the plan to see if your planned trip is affected. TIP: Use Metro’s Trip Planner to plan how to get where you want to go in the Washington DC area, using Metrobus, Metro and local bus systems. Metrobus service also covers all of Washington, D.C., and portions of Maryland and Virginia. Bus stops are indicated by red, white, and blue signs, and bus route numbers and destinations are displayed above the windshield and on the boarding side of each bus. For even more flexibility, Metrobuses are outfitted with racks on the front where riders can attach bicycles. Instructions for riders are available at this web page. Let departing passengers out before you try to board. Doorside seats are reserved for senior citizens and riders with disabilities. Use headphones with electronic devices. Don’t eat, drink, smoke, or litter on Metrobus, Metrorail, or in Metro stations. The Transit Police may (and do) issue citations–and can even arrest those who violate this prohibition. For safety, don’t lean against bus or railcar doors. Don’t try to dash or squeeze through railcar doors as they are closing—they close hard, won’t necessarily re-open, and you can be badly bruised, or lose bags or luggage. Complete guidelines for riding Metro can be found on the Metro rules and manners page of the WMATA website. WMATA has created a Visitor’s Kit containing most of the information you need to use the system like a local. The kit can be ordered by calling 1-888-638-7646. Order at least 3 weeks before you come. A downloadable guide also is available from the Visitor’s Kit webpage on the WMATA website. Metro also has a general information line (202-637-7000). TIP: For transferring between Metrorail and Metrobus, or transferring from bus to bus, the SmarTrip® card offers the best value. SmarTrip® cards are refillable, and money-saving options are available—such as the Senior SmarTrip® card or a special pass. (One-day, 7-day, and other passes are available that may suit your particular needs.) SmarTrip® cards may be purchased online or using the machines at Metrorail stations, Metro sales offices, and other outlets. When you use your SmarTrip® card, you get a 50-cent discount from bus to rail, or rail to bus. But in using your card for the bus, you get free transfer within a two-hour window when you first use your card, whether or not the lines are contiguous. 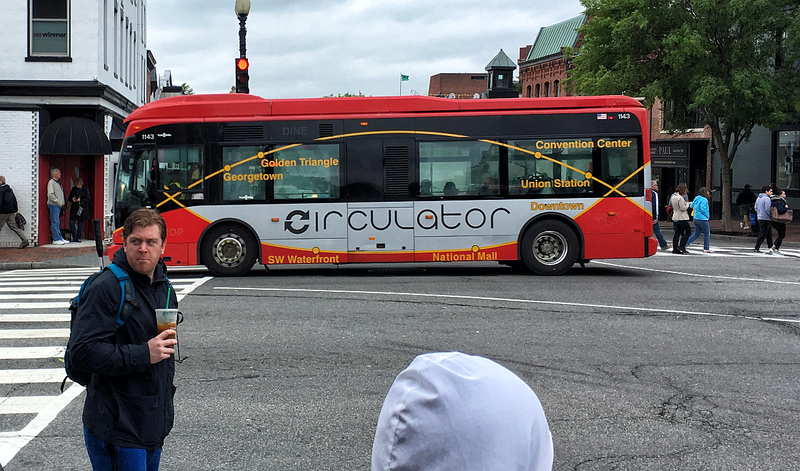 At $1.00 per ride (payable in cash, Circulator passes, or using the SmarTrip® card), DC Circulator buses offer an easy (and economical) alternative to Metrobus for accessing many downtown sights. 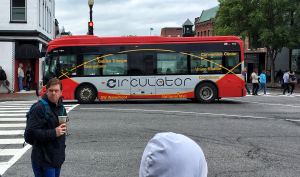 The circulator bus runs roughly every 10 minutes throughout the day and early evening. Some lines change service after 9 p.m.; consult http://www.dccirculator.com/ride/rider-tools/schedule/ for more information. Riders who pay using a SmarTrip® card can re-board the Circulator for free within two hours of first boarding the bus. Riders who pay in cash (dollar bills or coins) must pay $1 each time they board the bus. DC Circulator buses run on six lines throughout the city. The Georgetown-Union Station line is closest to the Marriott Marquis (bus stop is at 9th St & New York Ave NW) and it runs from Union Station to Georgetown and back.